As economic conditions continue to be less than desirable in, the Calgary real estate market has also continued to be negatively impacted. 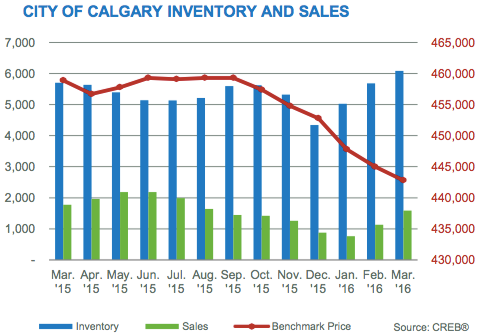 Not only have Calgary house prices fallen, but inventory levels are also on the rise. During the month of March, the Calgary labor market did not experience any improvement. In fact, provincial unemployment rates are the highest they have been since the early 1990s. 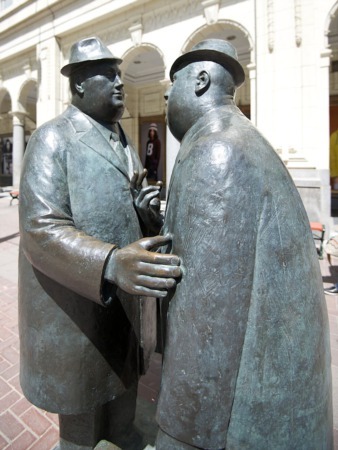 In February, Calgary’s unemployment rate increased to 8.4 percent, which is 0.5 percent higher than the provincial average. 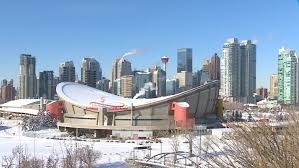 Problems with Calgary’s economy has placed downward pressure on the Calgary housing market and its' prices. In March, Calgary’s benchmark price fell by 0.49 percent to $442,800 when compared to February. When compared to March of 2015, the benchmark price fell by 3.51 percent. Housing sales have also fallen, with March seeing a total of 1,588 units sold. This represents an 11 percent decline when compared to March of 2015 and a 28 percent drop when compared to the long-term averages for the month of March. At the same time, Calgary experienced a significant increase in housing inventory, with supply increasing within most price ranges. Overall, inventory levels reached 6,084 in March, representing a seven percent increase. As such, the months of supply averaged five months during the first quarter of 2016. While most sectors are experiencing problems, the Calgary condo sector has experienced the most difficulty. 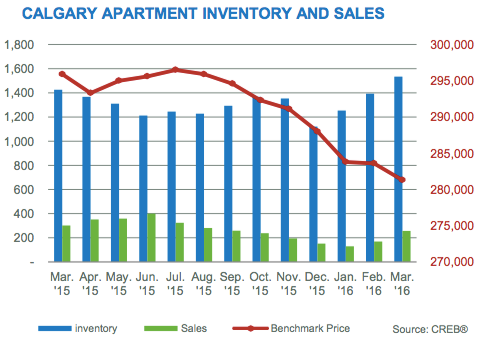 After the first quarter of 2016, apartment condo sales experienced a 17 percent decline to 554 units. Apartment benchmark prices have also fallen since late 2014, reaching $281,300 in March. This represents a seven percent drop when compared to prices before the economic downturn and a 4.93 percent decline when compared to March 2015. The detached and attached sectors have also experienced a significant downturn, with both seeing a four percent drop when compared to the recent peak. With the warming spring weather, the number of potential buyers visiting open houses and showings has seen a slight increase. This activity has not, however, resulted in improved sales within most of the market’s segments. Overall, it appears that many homebuyers are waiting to see if there will be more drops in home prices before they move ahead with making an offer. Determining when the market will “bottom out,” however, is quite the challenge.